Iain Banks, the great Scottish author, once said, “Technology determines the possibilities of society.” This has been true since humans developed basic tools, and it remains the case today, although those possibilities and the rate that they change are far removed even from what we imagined even just 10 years ago. In Singapore a driverless bus was due to start running in 2017; in China face recognition systems are used to authorise payments and track criminals; and in Scotland we’re seeing the trial of a wearable device that can monitor hospital patients and alert their doctors of any changes in their condition. So what technological developments can we expect by 2030? 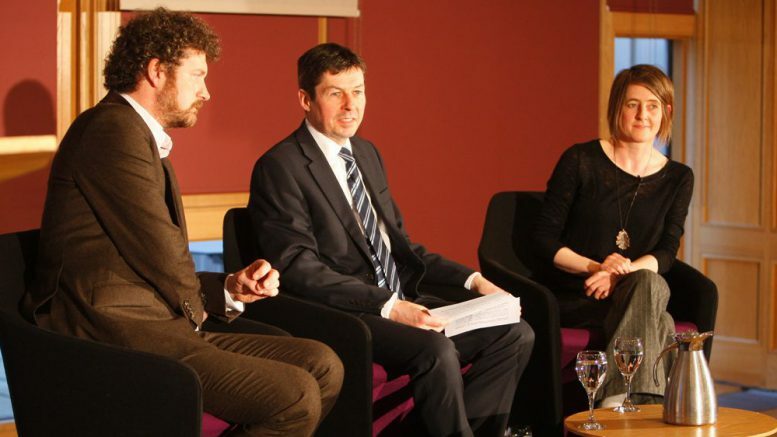 How will Scotland change and how can we make that change positive for our society? 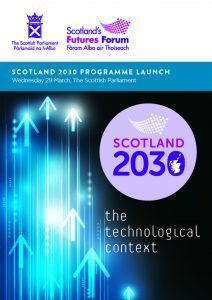 These questions and others were considered at the launch of the Scotland 2030 Programme, hosted by Rt Hon Ken Macintosh MSP, the Parliament’s Presiding Officer and chair of the Futures Forum’s board of directors. Minecraft developer and videogames entrepreneur Chris van der Kuyl provided an expert take on the technological development we can expect by 2030. Chris laid out his expectation for automation and driverless vehicles and flying drones to transform our infrastructure and way of life, particularly in rural areas, while noting the implications for jobs in many areas of the economy, including hitherto untouched professions such as accountancy and the law. Award-winning folk singer, songwriter and essayist Karine Polwart reflected on the cultural implications for our society, reading three imagined news stories from 2030. The first of Karine’s stories, Betty Bags a Booker, looks at the concept of human dignity in a future where large sections of the community find themselves without paid employment. A Digital Haven considers the challenges of social media for young people and how the tension between a desire for solitude and the need to stay connected digitally might play out in a country like Scotland, which often sells itself on its wilderness and natural environment. The third story, Karmic Payback, explores the power relationships between ‘data generators’ and ‘data analysts’ in a world where our lives are increasingly defined by ‘datafication’. Click the image below for a full written report of the event, including Karine’s three stories from 2030. Technology: the driving force of human civilisation? Blog to the Future post from Futures Fellow Nicola Martin on the historical role of technology in our society. What will life be like in 2030? Read these thoughts from Danish parliamentarian Ida Auken. “Deep Shift: Technology Tipping Points and Societal Impact” (3.86MB pdf) – the World Economic Forum’s detailed report on developing technologies and their societal impact from 2015.